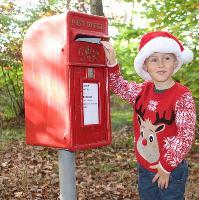 Come and write your letter to Santa at Brockholes before heading off on a winter walk to Santa's Post Box! Make sure that you find the secret North Pole Stamp on route or your letter won't make it to Lapland! Once you've posted your letter, join us for a warming hot chocolate by the fire in our Reedbed Restaurant. Letter packs include a letter template and envelope, a Brockholes Pencil, full instructions and a trail map to help you find the special North Pole Stamp and Santa's Post Box plus a voucher for a hot chocolate in the Reedbed Restaurant on your return. Letter packs are priced at £5.00 for online orders (available until 11.45pm the day before) or from our Welcome Centre on the day at £6.00 per pack. Letter packs are available to purchase and online orders to be collected from 10.00am - 1.30pm. Come dressed for the weather wearing sturdy footwear. The trail is outdoors on the reserve.